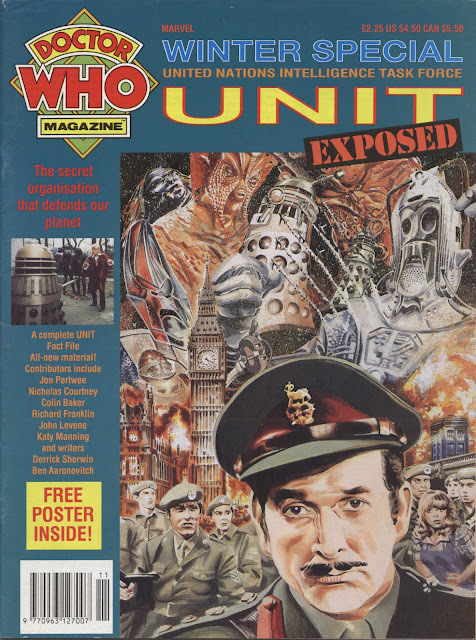 The 1991 DOCTOR WHO WINTER SPECIAL, from MARVEL UK, had a U.N.I.T theme with an inevitable tilt towards the Pertwee era (including a nice new seven-page comic strip, by Dan Abnett and Brian Williamson, pitting the dandy Doc against the Master). Another nice touch was a cutaway (in the EAGLE, TV CENTURY 21 tradition) of the "Alien" (aka The Whomobile), Pertwee's indulgence as rendered by Lee Sullivan. Text fiction came courtesy of Abnett and Colin Baker. Yup, the sixth Doctor tried to make amends for a lack of U.N.I.T action in his truncated run by crafting his own encounter with the Brigadier. The remaining pages were filled-out with the usual excellent articles readers had, by 1991, come to expect from the magazine.